When navigating murky waters, it’s good to have a map. One such chart of Seattle produced by the Department of Planning and Development as part of the process to figure just how, exactly, the state will regulate commercial cannabis in Seattle following I-502’s approval is making its way around inboxes and social networks. 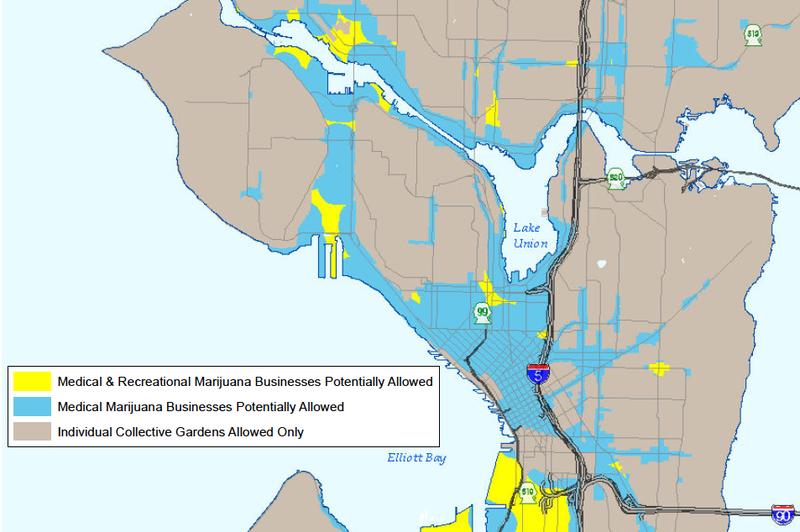 It shows just how restricted the Seattle’s “Cannabis Zoning Restrictions” could be. The interested and the entrepreneurial of First Hill, Capitol Hill and the Central District will also notice the area’s single zone of commercial marijuana opportunity — 23rd and Union. “I was kinda hoping for Little Amsterdam,” real estate investor and business owner Ian Eisenberg tells CHS — only partly joking — about potential names for the business district that could take shape around the Central District’s 23rd and Union. Eisenberg, who has emerged as a major landholder at the intersection and has plans for more development, said he hasn’t seriously started working on building a cannabis economy at the corner but he’s definitely been sharing the map around the neighborhood. The city’s planning process around cannabis zoning started last year to deal with the growing effort around medical marijuana and hasn’t yet expanded to deal with the implications of a new commercial market for the drug. The City of Seattle is proposing to implement zoning restrictions pertaining to the growing, processing, and dispensing of cannabis in certain zones within the city for the purpose of limiting the impact of larger-scale cannabis-related activity.  an amount of cannabis product that could reasonably be produced with 72 ounces of useable cannabis. The proposed ordinance would also implement a size limit for indoor agricultural operations in industrial areas and make a minor change to clarify the intent of existing allowances for certain agricultural uses in industrial areas. City Council’s Sally Clark and Nick Licata who are in the midst of a road show around the city to meet with district councils about the proposals are quick to clarify that they are focusing only on medical marijuana even as DPD looks ahead. Clark said that Licata and Council staff have met with Washington Liquor Control Board representatives to begin discussions on recreational sales regulations. The DPD map shows how the pieces *could* fit together — a look at the way things could work without more significant changes by the state or City Council. The Stranger’s Dominic Holden first published the document last Friday. The map overlays federal, state and city boundaries that planners believe would exclude the presence of liquor board-licensed commercial marijuana stores. Once the required buffers are placed around everything from schools and libraries to community centers and parks, central Seattle ends up mostly a commercial cannabis-free zone. The exception is 23rd and Union. “I’m not opposed to it — I’d be very open to it,” Eisenberg said of the potential that commercial space in the neighborhood could be part of Seattle’s first forays into legal commercial pot. But, Eisenberg said, while he sees the potential opportunity in being one of the few places in the Seattle to buy legal marijuana, like others in the community he’s also worried that the constricted zoning could put too much pressure on an area like 23rd and Union though it’s possible that mobile services might relieve some of that pressure. There is also some historical irony in the potential for a “drug market” to develop at 23rd and Union. Seattle Police spent years developing a “Drug Market Initiative” that targeted the area to eliminate illegal drug dealing from the neighborhood. The zoning change legislative process is slated to play out early this year with City Council. For now, the DPD proposals are focused on restrictions around size and Clark and Licata are keeping the discussion limited to medical use. Whether there is stomach on the Council to take on a much heavier load of trying to expand Seattle’s commercial zones isn’t yet clear. The alternative will need to be concerted effort to protect the areas where the stores can exist. In the meantime, it might be time to start thinking of non-legislative protections for the rare resource that 23rd and Union might represent. More development is coming to the area — Capitol Hill Housing is planning this mixed-use project for the area now. Eisenberg and others could find themselves in the peculiar place of trying to keep out anything that could jeopardize the zoning. It could be a heavy burden. It could also be a major opportunity. If it works out, we know a bakery that might be looking for a home. Whichever candidate for mayor promises bike paths thru Capitol Hill to 23rd and Union gets my vote & donation. Kinda serious. As others have noted (mainly Dominic), the lack of legal banking possibilities ( http://seattletimes.com/html/editorials/2020250714_editmarij ) will result in the customers and the marijuana stores exchanging wads of cash for bags of cannabis. This will result in a recently street crime challenged area in which both the stores and the customers will have lots of both marijuana and cash. Much as I want to, it’s hard to imagine this playing out well in the short term. There are already medical marijuana dispensaries awash in pot & cash. Not to mention cash-only gatherings like farmer’s markets and flea marts. More eyeballs on the street -> less crime. Nothing against MJ – it’s a positive fewer people will be going to jail, but is this really the best this city can come up with for my neighborhood? I live near 25th and I say bring it on. Having lived in this neighborhood for going on 15 years, I couldn’t agree more that “more eyeballs” means less crime. Is this the ideal plan for the CD? Probably not, but it’s certainly better than a series of vacant lots. If things are managed well, ideas like this could do that corner a lot of good. It’s walkable/bikeable from Cap Hill and there’s bus service going in all directions. The corner might gain enough gravity to attract other businesses and maybe even a bank. The more people spending time and money in our neighborhood the better! On the other hand, if the corner is nothing more than a stoner-magnet, then it’s hard to see any long term benefit to the area. I love the city of Amsterdam, but not because of the coffee shops. If 23rd and Union was home to a few marijuana-sellers, that’s great, but I’d hate to see a street lined with nothing but green bud flags, head shops and stores selling tie-dye and hacky sacks. If we’re going to build a Little A’dam, maybe we should pass the bong and consider how other business and organization might compliment/counter-balance the pot shops. Good points and I agree. But there are already some food joints around there which would go well with stoners. Med Mix, the cajun place, 4 coffee joints close by, Neighbor Lady. Ezells further down 23rd. Twilight Exit isn’t far over on Cherry near the BBQ Pit. Taco Truck up Union near the Union Market which also serves food. These places could do well. Wonderful. Just as that intersection begins to have a glimmer of hope of coming out of a long slumbering hole, we want to go trash it up again with pot shops? Anyone who thinks that wouldn’t bring on all kinds of thuggery, muggings, and holdups is just deluded. Just what the CD needs. And this “eyeballs on the street” concept is drivel. Capitol Hill has lots of “eyeballs on the street” and it doesn’t seem to deter the muggings and holdups there, does it? It’ll be as bad or worse at this intersection, and it will likely include a lot more shootings, too. I don’t see how people legally engaging creating and consuming in something that has a decidedly somnorific and relaxing effect is going to in any create “drive-bys”. Do drive-bys more often happen near liquor stores or breweries? It’s not the City, it’s the State (I-502). And those MMJ places have been held up, too. I remember reading recently the Green Door (@ 12th and Jackson) was hit not long ago. It’s in a busy little Asian strip mall with lots of “eyeballs on the street”, and it didn’t help. This wouldn’t be any different. Why would we want to concentrate dispensaries into these areas rather than spread it out? Do we have these zoning laws for liquor and tobacco? This will be more like Hamsterdam. Where’s Bubbles? Jim, I agree completely. It’s very sad that, just as that area seems to be on an upswing, it will go downhill again if there is a proliferation of pot shops. I believe there are going to be many “unintended consequences” of legalizing marijuana, and this is one of them. That ship has sailed, the point is moot. 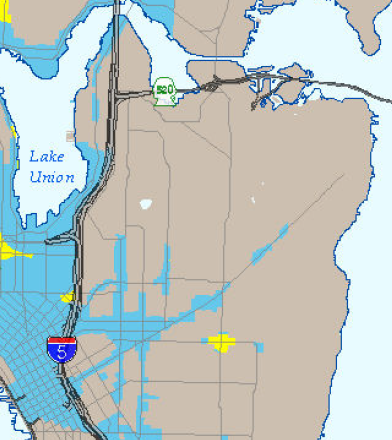 The zoning restrictions were part of i502 as voted on. I’ll take a couple of legal cannabis shops over the proliferation of crack dealers who used to infect the intersection. And a grow-and-sell operation might serve as a good use for the USPS station once they pull up stakes. As for hand-wringing over potential (and currently unsubstantiated) dire consequences, I say let’s wait and see. Yes, there will probably be scads of cash coming into the area, which creates a potential for attracting petty criminals. But, if shops maintain reasonable hours of operation, when there are most likely to be more people in the area, I don’t see it being any more or less of an attractant than your typical bank or convenience store, both of which also deal with a large number of cash transactions on a daily basis. And it doesn’t seem terribly likely that many reasonably sane people are going to risk arrest & imprisonment by mugging someone for what is going to amount to a few tens of dollars worth of product, any more than they would for a bottle of booze you’re carrying on your way out of the liquor store.